Backgammon playing pieces are known variously as checkers, draughts, stones, men, counters, pawns, or chips. The objective is to remove (bear off) all of one's own checkers from the board before one's opponent can do the same. The checkers are scattered at first and may be blocked or hit by the opponent. As the playing time for each individual game is short, it is often played in matches, where victory is awarded to the first player to reach a certain number of points. Each side of the board has a track of 12 long triangles, called points. The points are considered to be connected across one edge of the board, forming a continuous track in the shape of a horseshoe, and are numbered from 1 to 24. Players begin with two checkers on their 24-point, three checkers on their 8-point, and five checkers each on their 13-point and their 6-point. The two players move their checkers in opposing directions, from the 24-point towards the 1-point. Points 1 through 6 are called the home board or inner board, and points 7 through 12 are called the outer board. The 7-point is referred to as the bar point, and the 13-point as the mid point. To start the game, each player rolls one die, and the player with the higher number moves first using both the numbers shown. 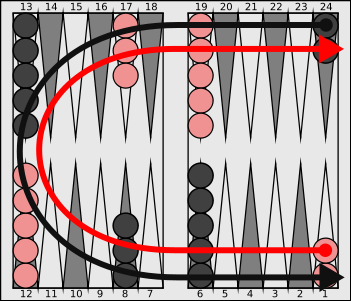 If the players roll the same number, they must roll again as the first move can not be a doublet. Both dice must land completely flat on the right hand side of the gameboard. The players then alternate turns, rolling two dice at the beginning of each turn. After rolling the dice players must, if possible, move their checkers according to the number of pips shown on each die. For example, if the player rolls a 6 and a 3 (notated as "6-3"), that player must move one checker six points forward, and another or the same checker three points forward. The same checker may be moved twice as long as the two moves are distinct: six and then three, or three and then six. If a player rolls two of the same number, called doublets, that player must play each die twice. For example, upon rolling a 5-5 that player may move up to four separate checkers forward five spaces each. For any roll, if a player can move both dice, that player is compelled to do so. If players cannot move either die in a roll, given the position of their checkers then that turn is over and the turn passes to the opponent. If either one die or the other but not both can be moved, the higher must be used. When removing checkers from the board ("bearing off"), the exact roll must be used unless a die is greater than any checker can use to bear off; in that case the die is played by taking a checker from the highest-numbered point off the board. If one die is unable to be moved, but such a move is made possible by the moving of the other die, that move is compulsory. In the course of a move, a checker may land on any point that is unoccupied or is occupied only by a player's own checkers. It may also land on a point occupied by exactly one opposing checker, or "blot". In this case, the blot has been hit, and is placed in the middle of the board on the bar that divides the two sides of the playing surface. A checker may never land on a point occupied by two or more opposing checkers; thus, no point is ever occupied by checkers from both players simultaneously. Checkers placed on the bar re-enter the game through the opponent's home board. A roll of 2 allows the checker to enter on the 23-point, a roll of 3 on the 22-point, and so forth. A player may not move any other checkers until all checkers on the bar belonging to that player have re-entered the game. When all of a player's checkers are in that player's home board, that player may start removing them; this is called bearing off. A roll of 1 may be used to bear off a checker from the 1-point, a 2 from the 2-point, and so on. A die may not be used to bear off checkers from a lower-numbered point unless there are no checkers on any higher points. For example if a player rolls a 6 and a 5, but has no checkers on the 6-point, though 2 checkers remain on the 5-point, then the 6 and the 5 must be used to bear off the 2 checkers from the 5-point. When bearing off, a player may also move a lower die roll before the higher even if that means 'the full value of the higher die' is not fully utilized. For example, if a player has exactly 1 checker remaining on the 6-point, and rolls a 6 and a 1, the player may move the 6-point checker 1 place to the 5-point with the lower die roll of 1, and then bear that checker off the 5-point using the die roll of 6; this is sometimes useful tactically. If one player has not borne off any checkers by the time that player's opponent has borne off all fifteen, then the player has lost a gammon, which counts for double a normal loss. If the losing player has not borne off any checkers and still has checkers on the bar or in the opponent's home board, then the player has lost a backgammon, which counts for triple a normal loss.